Samsung has unveiled its new mirror and transparent OLED displays in Hong Kong, and from the sound of it, the company has big plans for both of them. While the event has only showcased the screens as ad billboards and as a virtual necklace stand, Samsung believes they have bigger uses in the future once they're integrated with Intel's RealSense technology. It plans to develop the mirror display, for instance, as a "virtual fitting room," made possible by the Intel technology's 3D cameras and an "automated library of stored perceptions." Customers can use the high-tech mirror to see what jewelries, clothes or shoes look like on them before actually trying them on to make sure they fit. 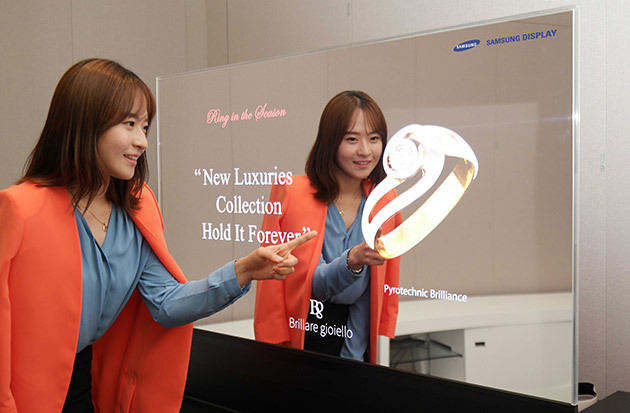 On the other hand, Samsung plans to use its transparent OLEDs for interactive ads that will take advantage of RealSense's voice and gesture control capabilities. The company claims its mirror OLED is sharper, clearer, has higher contrast and faster response times compared to mirror LCDs already available today. Its transparent OLED is apparently more colorful and clearer than similar technologies, as well. It'll likely take Samsung some time to make these plans a reality, but we doubt the company's slacking off either. After all, it has to compete with a lot of other companies also developing virtual fitting rooms and interactive ad displays of their own.